Kindly enlighten us about Donear Industries ready to wear segment? 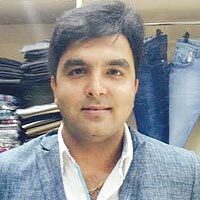 Donear Industries Ltd, India’s one of the top most textile companies has two brands in its ready-to-wear segment. We launched D’Cot in October 2007 as a value retail brand, it soon became the trend setter in value retail apparels category and thereafter looking at the success of D’Cot, we launched Donear NXG in January 2011 which is a mid-priced brand for young office goers and entrepreneurs. D’Cot offers trendy shirts, formal wear, denims, formal trousers, casual trousers, t-shirts & accessories like socks, handkerchief, wallets & belts. Donear NXG offers casual shirts, smart formals shirts and trousers, tees and a wide range of accessories. Apart from men’s wear, do you wish to foray into any other segment in the near future? As of now we are focused to grow in menswear segment. Till date we have already opened 50 EBOs, we will open 30 more EBOs by the fiscal end. While in 2015-16, we plan to open additional 100 EBOs. With multiple brands dealing in textile and apparels, is this sector becoming highly competitive? What is your take on it? Who are your major competitors? Apparel retailing is already a highly cluttered segment which has all time high competition due to no entry barriers, innovations does last longer and are copied easily. What keep us ahead of competition is our business format and the value proposition that our brand offers. A few years ago, we witnessed that the discount format was completely wiped out. As change is constant we kept on adapting the new wave, so we sailed. Today we are the most trusted brand in apparels value retail. Our competition is majorly from unorganised retailers. When did you start franchising? What made you choose the franchise route? We started franchising in October 2007 with 19 EBOs and today we have more than 300 EBOs considering D’Cot ,Donear NXG and Donear Exclusive (Fabric + Apparels) operating in 18 states. It’s the legacy of Donear that we want to continue forward, Donear is well recognized among its channel partners for its transparency of dong business. Our channel partners are our greatest strength to adapt the similar pedagogy in retail. We chose franchise model to leverage our brand equity. We will be adding 80 EBOs by the year end 2014 while in 2015-16 we intend to open additional 100 EBOs. We will soon be the single value retailer in the country with 500 EBOs all of them owned and managed by franchisees. We are targeting semi metros, tier-I, II, III and even IV towns. How many outlets do you presently have? We are currently operating 100 EBOs of Donear NXG, 150 EBOs of D’Cot and 50 EBO’s of Donear Exclusive (Fabric + Apparels), in all 300 EBOs. All the EBOs are franchise stores. Where do you see your brand five years down the line? Five years from now, we will have the highest market share in the value retail menswear apparel segment. We intend to reach the 1000 EBOs by 2020.